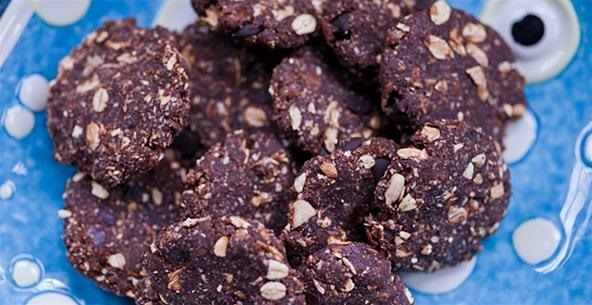 Make delicious raw mint chocolate cookies in a few minutes! Grind up the dates so that they are in small pieces. Add into a bowl along with the almond meal, oats, cacao and chips. Mix a bit. Add in the vanilla extract, vanilla creme, peppermint extract and honey. Mix with a spatula and then with your hands (it makes it a whole lot easier, even though it's a bit messy ) Add in more dates and/or honey if your mixture isn't quite holding together enough. 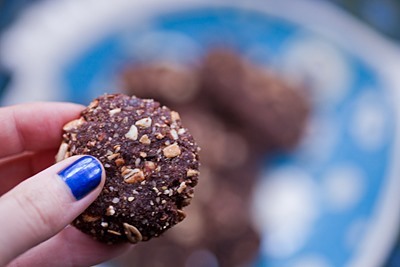 Take a small amount of the mixture and form into a ball, then press it between your hands to form a small cookie shape. Place cookies in a container and put in the freezer. You can also eat them straight away but they firm up a bit when in the freezer.